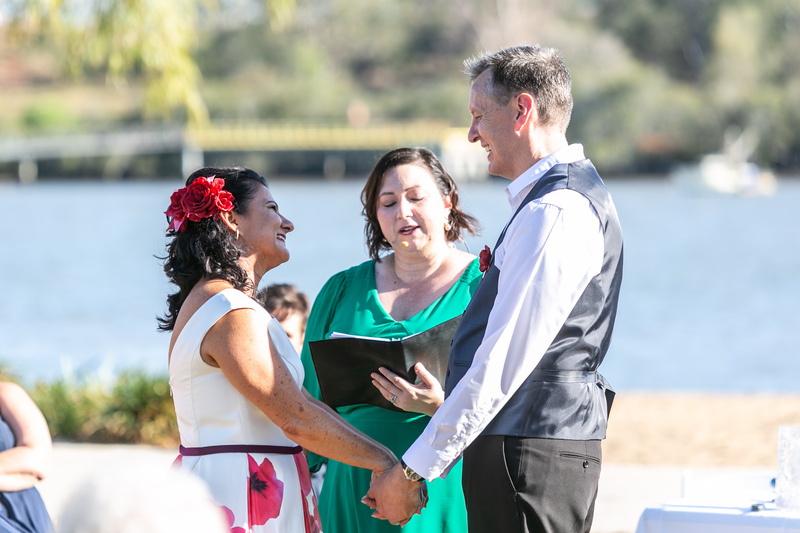 Guest post from Celebrant, Krista Webb. “I just want to have a big party” is the phrase I hear most of. In fact, I remember stating that exact phrase when I was in the midst of wedding planning. Choosing the right Marriage Celebrant that will set the vibe for the rest of the day should be at the top of your list. 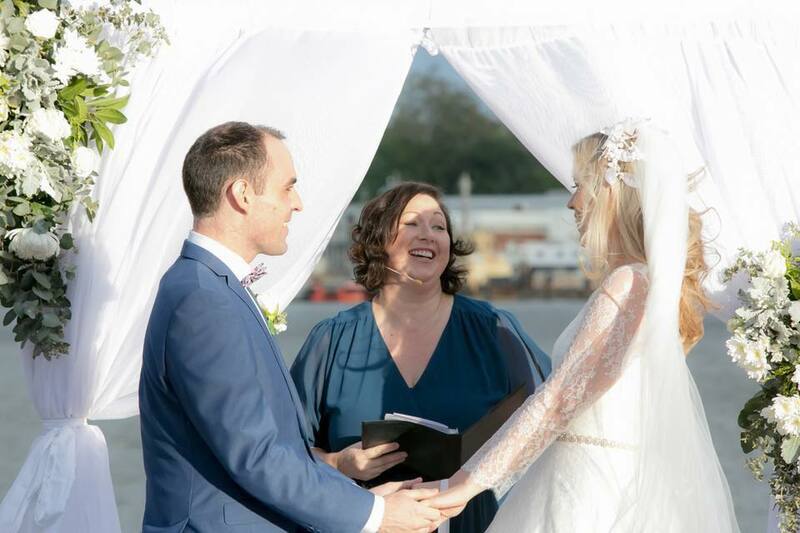 The ceremony will be the most special and intimate part of your entire day and having the right people by your side will help calm your nerves and keep you from feeling overwhelmed. Your day will flow seamlessly with a little bit of forward planning. Here are my top tips for planning your wedding ceremony. When most people think of personalising a ceremony the first thought is ‘vows’. I definitely love personal vows that come from the heart and add humour to the moment but there are even more ways to incorporate who you are in to a ceremony. You may want to think about having your Celebrant introduce your ‘squad’ (attendants), or instead of having a reading, ask a few family and friends to share their marriage wisdom. 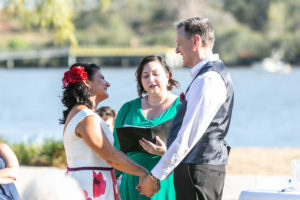 I recently had a couple have a flash mob during the ceremony and another couple had everyone take a shot of Sambucca as I announced them as husband and wife. Having your fur babies involved in your special day is also becoming increasingly popular but I’m yet to have a cat deliver the rings! Guests generally arrive around 20 minutes before the start time and with our hot Brisbane weather it is a great idea to have a refreshment station available. Grooms often appreciate this as well whilst nervously waiting for their bride. Sometimes couples provide fans or umbrellas to beat the heat but the best advice I can give, is plan your outdoor ceremony with the sun in mind. Guests are quick to get hot and bothered when waiting in full sun and photographers find it difficult to get that great shot when you are squinting. Wind and stilettos are not a friend of outdoor ceremonies. Of course, you can’t always predict what the weather is going to be like but consider very carefully if you are going to wear your hair down or wear a veil. Veils do tend to blow away in the strong wind, although it makes for an awesome photo! Your Celebrant may suggest swapping sides as a way to stop your hair or veil blowing across your face. 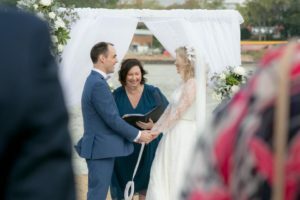 Footwear is a huge consideration for outdoor ceremonies and as a Celebrant, I learnt very early on that wedges, flats or heel stoppers were the only way to go. There is nothing more uncomfortable for a bride and the attendants than to be sinking into the ground, not to mention wrecking the heels of your gorgeous shoes. Of course budget is a huge consideration but having items such as insect repellent, sunscreen or tissues available for your guests is a thoughtful touch. Blankets or wraps at a rustic winter wedding will save your guests from frostbitten fingers and can also be used at the reception if it is outdoors. Remember why you are getting married and remember who you are marrying. Live in the moment and don’t sweat the small stuff. It’s not about the weather, the location, the decorations; it’s about the two of you. So don’t forget to have fun and celebrate with your family and friends. Holly is our Brand & Marketing Manager at Northshore Harbour. A proud "dog mum" and strong ambassador for "Wine Wednesdays". She's our Hype Girl and is always there to bring a situation from a 3 to 10 real quick. Wedding Tips for the budget savvy bride & groom! 6 BEST TIPS FROM A FLORIST TO SAVE YOU TIME, MONEY AND STRESS!